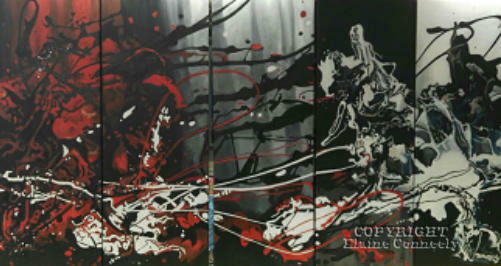 5 Panelled Black and Red Abstraction - each panel is 1.5 ft x 4 ft oil on deep edged canvas. 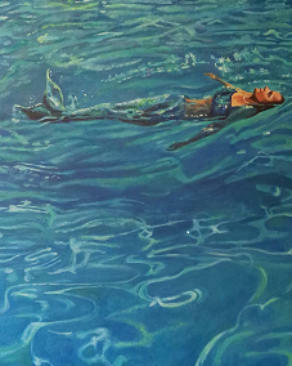 This series of paintings was done as a commission and took over four months to complete along with two other paintings for the same client. this is not my usual style but the client was delighted with large impressive series which hangs proudly in their living room. 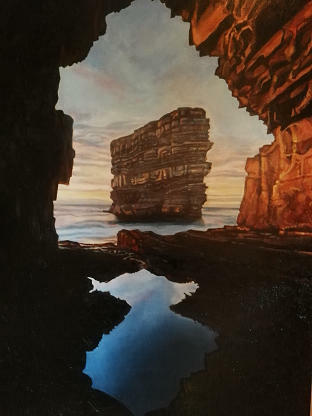 Dun Briste- a 3.5 x 4.5 ft deep edged canvas oil painting completed for the client who also commissioned the 5 panel abstraction. The end result was beautiful and the client was delighted. 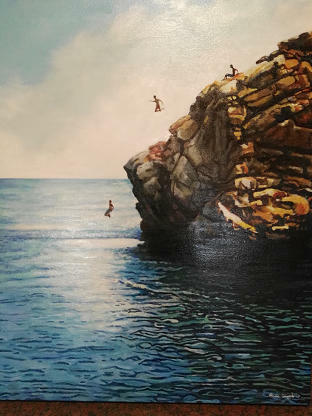 The Jumpers-a 24 30 inch deep edged oil painting on canvas of a huge rock in Croatia that the clients children had jumped from on their holidays. 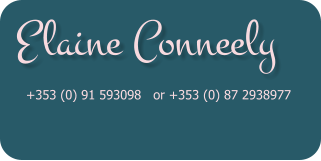 Sentimental and precious to the client. 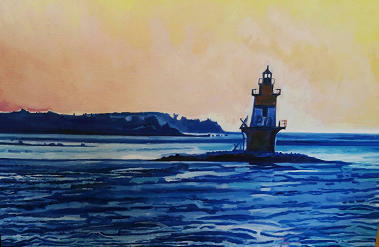 John's Coffee Pot Lighthouse - 24 x 30 inch oil on deep edged canvas completed as a gift for my brother when he turned 50. 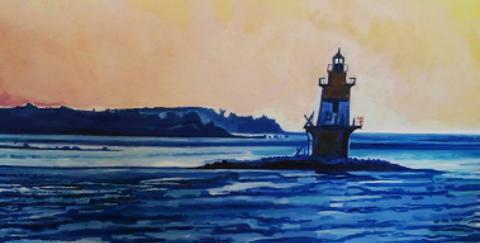 This lighthouse featured in our childhood as we passed it going Blue fishing and stripe bass fishing with our father. John was thrilled with the finished work. Lake Cearrai, Connemara- 24 x 30 inch oil on deep edged canvas. A commission by a local man for his father. The lake is very important to the family history. They loved the painting. 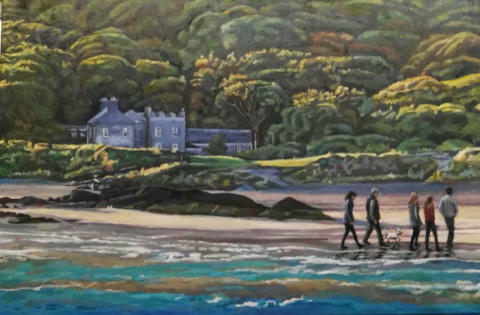 Famous Estate along the Kerry Shore with Local Family- 24 x 36 inch oil on deep edged oil canvas. I was commissioned to recreate the image of this house and beach from a photograph and then add in the family walking with their dog. 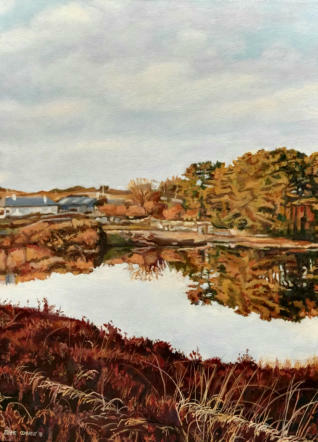 The painting was a challenge as I add to invent the family walking and their dog because the client was presenting it as a surprise gift to the family. 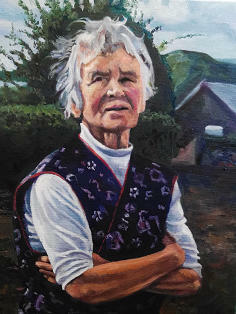 The client was very happy with the result.
. Lady- 16 x 20 inch oil on deep edged canvas- This was a commission for a gift. This is the person's mother and she was surprising her brother with the painting. They loved the likeness. 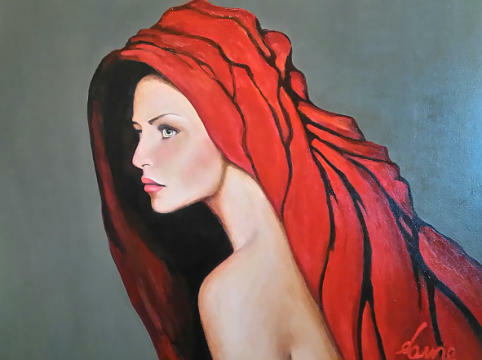 Lady in the Red scarf from the White Gables Restaurant Moycullen- 24 x 30 inch oil on deep edged canvas. This was a copy of a well known painting I was asked to do by a man as a birthday present for his wife. The result was excellent and they were more than thrilled with the finished painting. 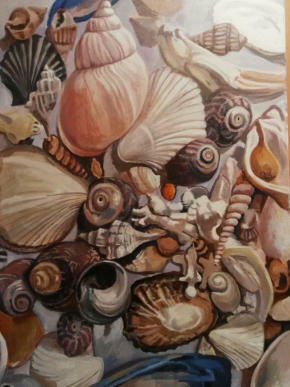 Shell Study - 24 x 36 oil on deep edged canvas. I did this large image of very small shells and was happy with the result. It is complete. 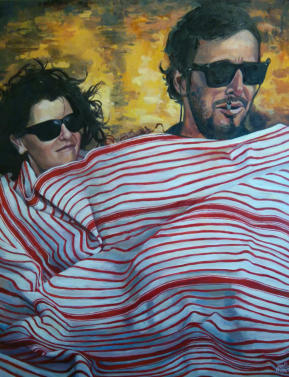 Sharon and Gueneal - 24 x 30 inch oil on deep edged canvas. I was commissioned to paint this for a friend of mine. it was a gift for his wife. She love it! Roses - 24 x 30 inch oil on deep edged canvas. 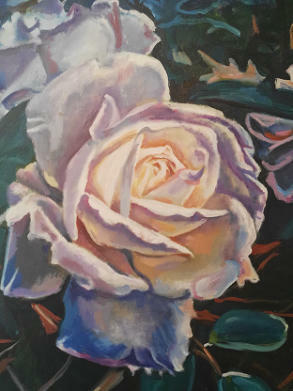 I passed these beautiful white roses one day and felt compelled to paint them. Noel - 24 x 36 inch oil on deep edged canvas. I was commissioned to do this by a man's wife who wanted to present it to her husband on the anniversary of her husband's brothers death. This image was created by combining two different photographs, one of the man, Noel. 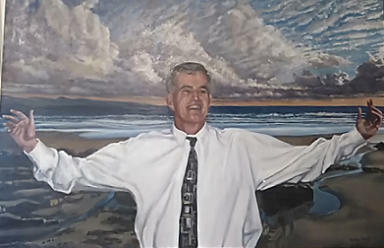 I then placed him in an image of a local beach that meant a lot to the family. 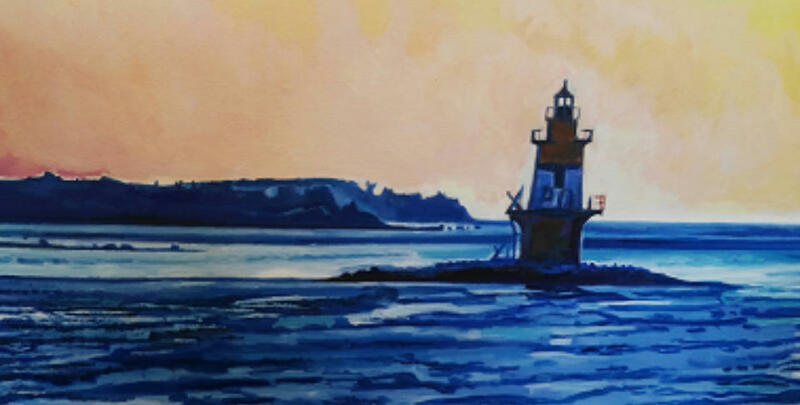 The painting was a success and they were very happy. 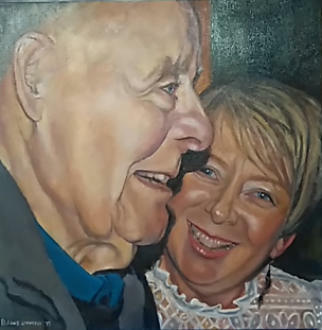 Katie and Her Father- 16 x 20 inch oil on canvas. A commission by a daughter as a gift to her father for his birthday. The likenesses are spot on and they were extremely happy with the painting. Lady- 16 x 20 inch oil on deep edged canvas- This was a commission for a gift. This is the person's mother and she was surprising her brother with the painting. They loved the likeness.